The Rev. Ted Voorhees has been Vicar of St. Cyprian’s since November of 2008. 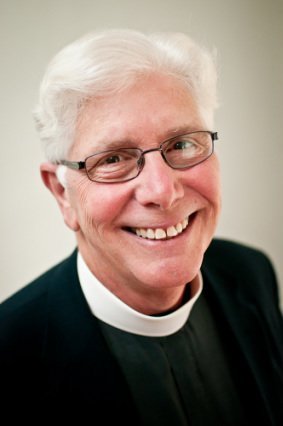 Ted and his wife, Caren Goldman, moved to the area in 2007 from Northampton, Massachusetts where he served for three years as a long-term interim at St. John’s Episcopal Church in the Diocese of Western Massachusetts. Prior to living in New England, Ted led congregations in North Carolina, Virginia, and Ohio. While serving as Rector of St. Mark’s Episcopal Church in the historic Old West End in Toledo, OH the congregation was honored nationally as a Jubilee Ministry for its extraordinary outreach programs to the city. Ted graduated from Virginia Theological Seminary in Alexandria, Virginia and was ordained in 1975. While in the metropolitan Washington, D.C. area he did field work at St. Mark’s Capital Hill and attended classes at Catholic University and American University in Georgetown. Prior to making the decision to become an Episcopal priest, Ted taught mathematics at the University of South Carolina and the University of Tennessee at Chattanooga. As trained Bridgebuilder conflict resolution consultants and Healthy Congregations trainers, Ted and Caren have used a systems based approach to managing conflict with more than 20 congregations in six different protestant denominations, as well as a number of secular non-profit groups such as the YWCA. As a gifted preacher and speaker, Ted is often invited to present at conferences and workshops. These have included the College of Preachers at the National Cathedral in Washington, D.C. and the Diocese of Massachusetts’s Episcopal City Mission. Additionally, Ted and Caren have led retreats nationally at renowned centers such as Kirkridge Retreat and Conference Center in Bangor, Pennsylvania and in churches on the East Coast and in the Midwest. He is the co-author, along with Caren, of Across the Threshold, Into the Questions: Discovering Jesus, Finding Self (Morehouse Publishing, 2008) and a contributing writer and former associate editor of the Bible Workbench. Ted and Caren have four grown children and two grandchildren in a blended family. Recent additions include two pups, Micah and Karma. He enjoys playing golf, gardening, and motorscootering around town. Originally from Tampa, Holly has made St. Augustine her home since 2005. Before coming to work as the wedding coordinator at St. Cyprian's, she worked as a florist for 6 years where she discovered her love of all-things-wedding. Holly ran bridal consultations, helping bring a bride's vision for their wedding flowers to reality, and she knows, first-hand, how important the details of planning can be to a bride, as she's planned many from start to finish. Holly is very excited to bring her love of weddings and industry experience to work at St. Cyprian’s. She considers it an honor to offer couples the opportunity to be wed in our beautiful, historic wedding chapel.